Kensal Road looking west Oct 1967 (RBK&C Local Studies). I lived in Kensal Road from when I was born in 1953 until 1966, for two years at number 87 and eleven years at number 89, so it might seem like a world class act of procrastination that I didn’t get round to going back until December last year. Actually, it wasn’t procrastination. As we were moving to Croydon in 1966, I made a conscious decision that it was going to be impossible to maintain my old friendships and, a few years later, I heard that everything I knew between the canal and the railway had been bulldozed so there seemed no point in going back although I got as close as Harrow and Portobello Roads on several occasions. First impressions were that Westbourne Park station had hardly changed apart from the loss of its kiosk, ticket collector’s box and old style ticket machines and the walk along the Great Western Road towards the canal bridge hasn’t changed ignoring the new bus station on the other side of the road and the Westway. However, after that junction, Kensal Road bore right down the hill following the line of the canal and, today, the new, well new to me, Elkstone Road bears to the left joining Golborne Road at the old junction with Southam Street. Second impressions were that distances seemed to have shrunk in the last fifty years. Number 89 was on the left about fifty yards before the old junction with Golborne Road exactly where Trellick Tower now stands. A four storey terraced house like most of the houses in the area, we lived on the ground floor, which was slightly higher than road level. Both number 87 and 89 were owned by a nervous looking Polish man, Mr Sohacki, who was apparently an officer in one of the Polish divisions in the Eighth Army. More of that later. His nervousness always seemed to change to profound gratitude followed by a slight bow before replacing his hat when my mum handed the rent money over in a weekly ritual. Maybe he was nervous because some of his other tenants weren’t quite so ready to pay up. I can describe the interior fairly accurately as I seemed to have the run of the house with the blessing of all the other tenants. Below, in the basement flat, were the Cullen family, father, mother and son Cornelius, which was shortened to Con. They had a separate entrance to their flat down a few steps from the road and an internal entrance under the first flight of internal stairs, which I used on a regular basis. Their basement flat was almost identical to ours with a large living room at the front, a single large bedroom at the rear, a corridor running front to back with the living and bedroom doors on the left and toilet on the right and, in a rear extension narrower than the house, a kitchen and bathroom. They had sole access to the coal cellar. I remember the rumble of coal being tipped into the cellar by the coal man who delivered sacks from the back of his horse drawn cart through the manhole at the bottom of the external flight of steps. The Cullens also had a garden at the rear of the house, which was really a scrubby rectangle of grass where they hung their washing and Con and I let off our fireworks on bonfire night. Our respective mums usually then took us to see the big bonfire and the older children letting off their fireworks on the bomb site in Golborne Road, where Hazlewood Tower now stands. My dad, who had immigrated to the UK in 1947 after serving in the Eighth Army, worked in the accounts department for Limmer and Trinidad Asphalt Company in Carnwath Road, Fulham and, on Friday nights and Saturday afternoons, as a baker although I’m a bit hazy about where that was. It meant he was a bit of a shadowy figure at times and, while its no exaggeration to say he probably hated doing a second job, it meant we were a bit more comfortable than most families in the area and he was usually keen to make up for lost time by taking us out on Sunday, sometimes to see a film or see the sights in central London. As we had a shared front door and all of the other tenants walked in and out past our living room door, that had a lock on it and the room was locked at night but left open during the day. The living room was originally full of heavy, brown Victorian furniture and had an open fireplace, which I remember was a major performance to light. Although I’m getting slightly ahead of myself, Barry Bucknell had a major influence on my parents and, looking back, I don’t suppose any of the furniture would have achieved antique status as, piece by piece over time and with the blessing of Mr Sohacki, my dad chopped up the old furniture and replaced it gradually with sleek 60s style, a coffee table with spindly legs, pine dining table, chairs and sideboard, three piece suite and two rattan easy chairs. The fireplace was boarded up and replaced by an electric fire. Until our first television arrived in 1962, the radio was our main contact with the outside world. Heavy and wooden like the old furniture, it lit up when switched on. Choices included the Light Programme and the Home Service and more exotically, Hilversum and Luxembourg. It was a big deal for me to be invited next door by Mr or Mrs Little to watch their television where the sitting room was often packed with local children. Mum and dad’s friends would seem to just pop in from time to time without any prior arrangement. As we didn’t have a phone and we didn’t know many people who did, social life just happened that way. The arrival of two single male friends of my dad’s, both Polish, would always mean a late night. I don’t remember their names except that one was young and the other old with a grey walrus moustache and, in fact, we only ever referred to him as ‘the Old Man’ although not to his face. The routine was always the same. The young man would knock on the door first and give my mum a huge bunch of flowers, which was the softening up process. This would be followed by the Old Man struggling under the weight of bags of food and drink, which would be distributed on the dining table. Thereafter, I was occupied with the gift of a large quantity of sweets and the occasional pat on the head while the adults ate, drank and talked their adult talk while the room filled up gradually with cigarette smoke. At some point in the evening, a music programme would be found on the radio and the Old Man would get up and dance, a bit, well quite a lot really, like Zorba the Greek, stamping on the floor, a point in the evening my parents dreaded as they tried to calm him down and avoid giving the Cullens below a headache, although they were always very good natured about it the next day. The Old Man was generous to a fault and took me out on a few occasions for a treat. He was a hospital porter and I know he was single and maybe a widower or divorced and often seemed to act like he had more money than he needed. Whatever his circumstances, he treated me as a kind of part time son, on one occasion buying me a very smart suit with long trousers, which my parents thought was ridiculous as all boys always wore short trousers then. In fact, our television arrived just before the 1962 cup final and it played a major part in home life after that. Robin Hood, William Tell, Dr Who and slightly later, the Avengers and the Prisoner kept me captivated and the swinging 60s with Ready Steady Go and Juke Box Jury heralded things to come for me. Although Sunday Night at the London Palladium was a perennial favourite for mum and dad, I was strangely attracted to Emma Peel and her Lotus Elan in equal measure without understanding why. All the big news events of the time were magically shown right in our front room, the Cuban missile crisis, the Kennedy assassination, the first men in space and Winston Churchill’s funeral although my ten year old self could never understand what Christine Keeler and Mandy Rice-Davies were supposed to have done or why John Profumo had to resign no matter how many times they talked about it on television. I mentioned that our living room door was unlocked during the day and one of the other children in the house, probably attracted by the sound of the television, opened the door one day to have a look and I’m sorry to say I punched him in the face and got into trouble. Family meals were always eaten in the kitchen as the dining table in the front room was for entertaining guests. Sunday lunch was always a ritual, on the table at the same time every week and always much more than I could ever eat. A portable transistor radio later provided the soundtrack to Sunday lunch with the Clitheroe Kid or Round the Horne followed by Two and later Three Way Family Favourites. Barry Bucknell’s evil influence stuck again when my mum decided to paint the old kitchen table pink. Unfortunately, it seemed to be the kind of paint that never really dried and it went the way of the rest of the old brown furniture shortly afterwards to be replaced by a table with spindly tapered legs. Our bathroom was beyond the kitchen and was just about big enough for the bath and a huge menacing looking geyser suspended from the wall. I’m sure I had a vivid imagination as I was always worried about the geyser coming off the wall and drowning me in gallons of scalding hot water. Upstairs from our flat was an intermediate floor with a bathroom and toilet, which was shared by all of the other tenants. One further flight of stairs up to the first floor was a two roomed flat occupied by a family, living room in front and bedroom to the rear with a kitchenette on the landing and, a further two flights up to the second floor were two bedsits, one in the front and one in the back. One bedsit had a kitchenette on the landing and the other had a kitchenette in an extension that looked like a garden shed, up a narrow set of wooden temporary looking stairs. They were all very friendly, no doubt attracted by my sweet and cheeky nature although I’m now very hazy about who they were. I remember a single mother and newly born baby who had moved from Helston, who left her husband and older children behind. I’m sure there was a story there. And before her in the same bedsit was a woman in her early twenties, Anna, who had beautiful blond hair usually set in a long plait trailing down her back. Probably another sign of the approaching swinging 60s, she was saving to travel to the Greek islands with Mykonos as one of her intended stops. Before she left, she gave me a book on Greece, which I’m afraid is long gone. My mum much later told me that Anna was a prostitute although she was always seemed to be like a younger version of mum to me. 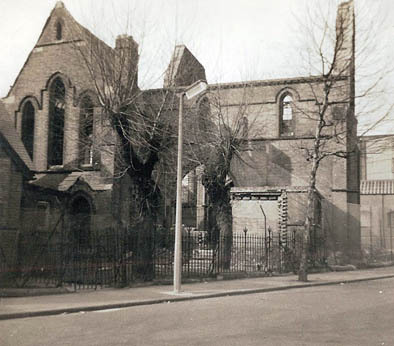 The bombed out St Thomas’ church on the corner of Kensal Road and West Row, about 1961. My Dad would rather half kill himself doing two jobs, which he did rather than expect my mum to be anything else but a full time housewife. Of course, there was no washing machine, vacuum cleaner, fridge or even a dishwasher, so housework was definitely more labour intensive then and my mum probably had it easier than most as there was only me to look after until my brother was born in 1959. Mum went shopping every day and the first stop was almost always Vic Martin’s shop. That photo at the top of Gwen’s blog could almost have been printed from my memory. I know that he was a serious stamp collector as he very generously gave me a large quantity of old British and Colonial stamps in a folder, which more than supplemented my meagre schoolboy level collection. He also gave me a few old Stanley Gibbons catalogues, which I pored over, cross referencing the stamps he had given me. My stamp collecting days gave way to other boyish pursuits and the catalogues are long gone but I still have those stamps. It was such a generous act that I often thought about why he would have done that and, although I will never know for sure, it’s possible that, as my father lived in Silesia before the war, where Vic Martin was interned as a POW, there was some kind of connection between them. Holmes the baker was usually the next stop followed by Price’s the greengrocer further down Golborne Road on the right hand side and then Hamperl the butcher on the same side of the road. The Hamperls were German, which meant that, as well as the usual choices of meat, they sold smoked sausages and delicious liver sausage. Chicken was a relatively expensive meat then and turkey almost unknown so chicken was always considered as a Christmas treat. One year on Christmas eve, my Dad returned from shopping, as I guess there was some heavy lifting required, and said he was sure that we had the winning raffle ticket displayed in Hamperl’s window. Mum and Dad hunted high and low for the raffle ticket and finally found it at the bottom of the kitchen bin, slightly crumpled and dad struggled home later with our prize 20lb turkey, which they had to cut the legs off to fit in the oven. I think we had turkey for breakfast, lunch and dinner for a few days running that year. There was an RSPCA surgery in a small parade of shops between our house and the junction with Golborne Road and a red phone box, which usually had a queue of people waiting their turn to press button A or B. I think everyone respected that people were waiting and each call never seemed to be long and, anyway, we could only ever call someone with a private phone so calls were limited to my mum’s parents and sister. A betting shop was opened later along the same parade and I’m sure they did good business next door to the Britannia, a pub with tiled walls that stood on the corner. It always seemed to be packed as I remember, if one of the doors was opened whenever I walked past, there was always a blast of noise mixed with the smell of stale beer and cigarette smoke. I bet it was good in there. Opposite number 89 stood a small chapel where I sometimes went to Sunday school, although I preferred Saturday morning pictures at the Essoldo in Great Western Road.. Next to the chapel heading west was the large Knitmaster factory and further along from that a Greek Cypriot barber where I had my haircut. Beyond the junction with Golborne Road, on the left, there were a number of small businesses operating, one of which pressed records. There were usually boxes of rejects outside, sometimes only rejected because they had the same label on both sides or the labels stuck on slightly off-centre. It was always a bit of a game to see how many records we could pick up and run off with before someone came out and tried to catch us. Actually, the best they could ever do was shout at us as we were always halfway down the road by then. I guess they needed them for recycling but the records were usually rubbish. Further along Kensal Road, on the corner of the path leading to the Ha’penny Steps, was the old swimming baths, which was always freezing and smelt so strongly of chlorine, my eyes were almost watering before I got in. It wasn’t all bricks and tarmac as, at the junction of Kensal Road and West Row was, and still is, beautifully landscaped Emslie Horniman Pleasance, which was a favourite walk. Sandra Dibble has sent in some photos. If you can add any more information about the locations, let us know and it can be added alongside the photos. Children playing in a bomb site. Can anyone recognise where it is? 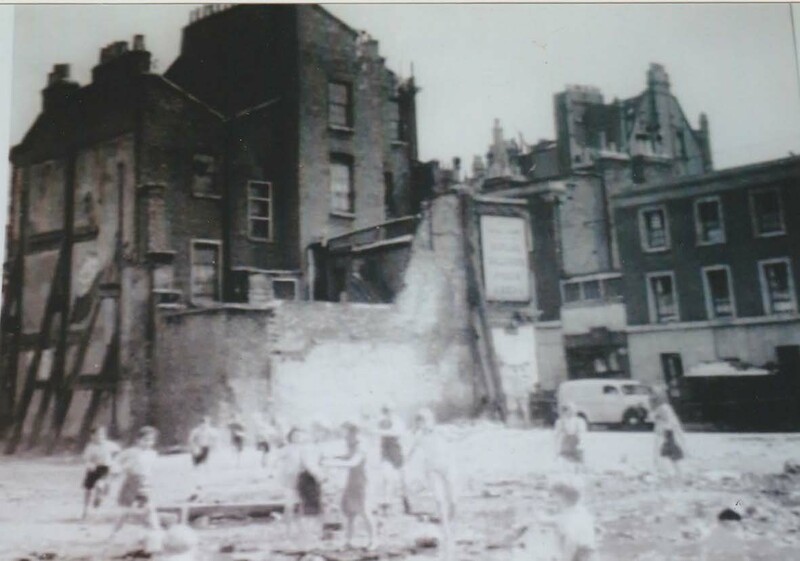 This photo below of is from Mark Davis who lived at 14 Golborne Gardens. The two boys lived opposite him. 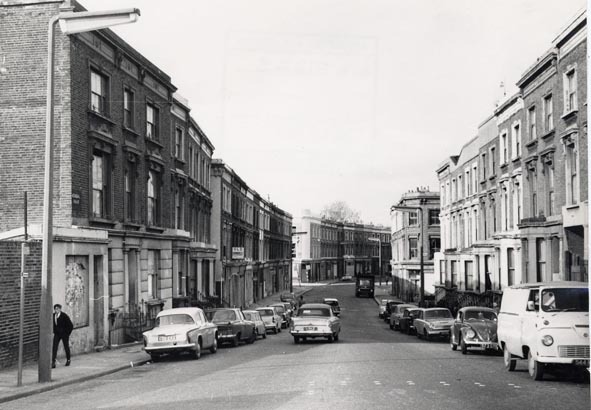 This entry was posted in Before the Westway, Golborne, Shops and tagged 1950s, 1960s, Elkstone Road, Emslie Horniman Pleasance, Golborne Road, Holmes, Kensal Road, Southam Street, St Thomas, Trellick Tower, Wesbourne Park. Bookmark the permalink. To Mark Davis. 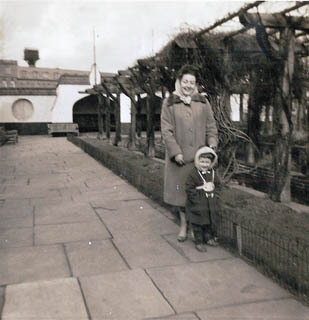 When you lived in Golborne Gardens in thre 1950 . Do you remember two lads called Keith Hill and Lawrance coggdale .they both lived on this road till it was pulled down in the 60’s All the best Allen. Hi Allen, in reply to the message you sent to Mark Davis, l don’t remember the two lads that you mention but my friend Jimmy Locke lived on the corner (the Derby)end his mum had a shop there. I think sok she made clothes but not sure, and another lad further down called Adam, we called him Adam Faith, we used to stand on his steps with a guitar and strum the life out of it (never did learn how to play) it would be interesting if someone remembers them. Coggdales Rings a Bell !! I was born in 58 might be big difference in Age !! The Flaherty’s lived next door to me in Golborne Gardens . Remember Ray Harper !! Keith west ! John and Micheal manning!! Steve Bargery!! The Orsmond’s !! Hi Rita. Will you please contact me on this Webb site. The last time that saw and spoke to you was in 1966 out side Wardles sweet shop in goldborne road. if you was Rita Allen then. All the best . Allen . Hi Roger did you post that you are doing a walk from Westbourne park station to end up at Ladbroke Grove station in April if so i would like to join you SANDRA. Hi Sandra – yes I did. Thank you for letting me know. I’ll look out for you on the day. We start at Westbourne Park station at 11am and finish at the steps in Southern Row leading up to Ladbroke Grove with the option to go to the Eagle for a well earned drink afterwards. I think quite a few will be doing that. I will post a reminder on all the usual FB groups nearer the time. Roger I would like to join in this walk. I grew up in Golborne Road 1953 to 1966. I went St Andrews School 1954 to 1958. It would be to meet up with people who grew up there during the fifties and sixties. Richard, you lived next door to us. We were at 19, above my mum’s shop that used to be Cross’s the shoe repairer before Mum took it on. Roger, ok if I join you and the others, Richard Wilkins? Hello Richard – I’m doing the walk on Saturday 6th April setting off from Westbourne Park station at 11am and finishing in Ladbroke Grove with the option to go to the Eagle for a drink after if you want. You should know at least as much as me about the walk. I’ll look forward to hearing what you remember about the old streets, See you then? Yes look forward to meeting up. This is what I rememder of the old Kensal Town in the 50’s. My dad worked at Westbourne Park station for G W R for 42 years in the blacksmiths department. 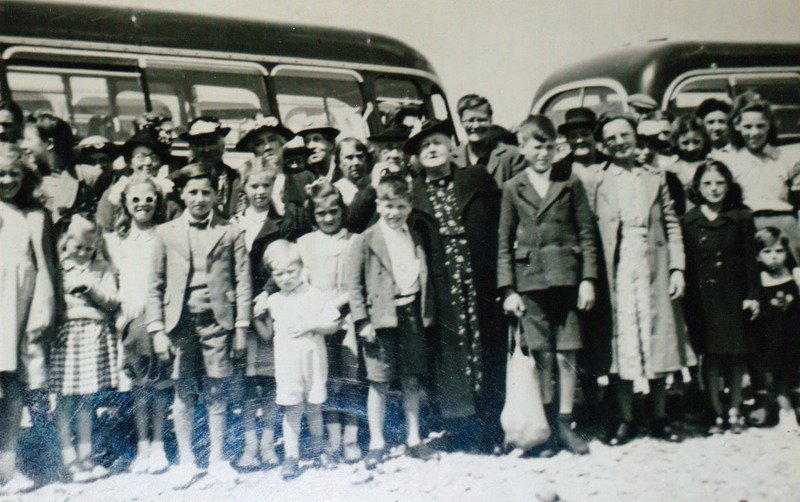 There was two big grey brick schools across road to the station – they were both closed. Walking to the old Kensal Road there was a horse trough on the left hand side, just before you come to Kensal Road. Also there was a bombed out old bank. Hello to all of you on this website. Part two of my memoirs of old Kensal Road in 1950. Just before you go down the hill on the old Kensal Rd, on the left-hand side was two old shops- both had bomb damage. On the right-hand side of the road going down the road there was an archway under the buildings leading to a horse stable yard where a farrier worked. His name was Ernie. On my summer holidays as a kid I spent some of my time watching him shoeing big cart-horses. Some of these big drays were from Charrington’s coal yard at the bottom of Westbourne Park Road. Well all for now, Allen. Hi .I have missed this part out. At the start of this Webb site theirs photo of my old kensal road memories. All the best Allen. Alan, my friend lived in the top floor two roomed flat in the house forming part of the arch leading to stables and work shop to the rear of No 1 Kensal Road. My friend helped drive a horse and cart to buy fruit and veg at Covent Garden. For reasons unknown the horse would bolt down Oxford Street each time. At Covent Garden in buying bananas the cry would go up, Tarantula and everybody got off the pavement very quickly. The bananas would be steamed with spiders falling out dead but not always! I remember we climbed out on the roof and would along the top wall with people on the street shouting at us to climb down. We gwould reply in jumping and down and standing on one leg. At the back of the house we would take turns to climb out of the kitchen window then climb down the piping to the roof landing to the ground floor kitchen. The start of the climb some sixty feet above the pavement at the stables. The front of the flat looked down onto Westboune Park station and the main line from Paddington. The flat was heated by coal fire with gas lamps. This was in 1965. Hi Richard. Thanks you for the post. The man you are talking abuot was he called Mr George Polio he had a fruit and veg shop on Carlton bridge and he had a horse and cart in the stables. I to help him and went to the old Covent Garden market. He had a black white horse also he had a store room in the seller of these flats. Could I ask a favour. I had informed Roger of intending to join the group on the walk on 11/4. Unfortunately I am unable to attend. Could Roger be advised. Thanks. I can let Roger know. We’re in regular contact. All done Richard. Your family were our neighbours on Golborne Road. My dad had the Green Shop 21 and Mum had the Brown Shop at 19. You had a brother (Gordon?) and lived over your dad’s shop. My brother’s name was, Graham. He now lives in Oxford. Graham has a daughter and grandson who live in Reading. Graham and family originally lived in Shepherds Bush near the QPR ground. He went to a school in South Kensington and passed going to a grammar school in East London. I failed the 11 plus and my parents sent me to a private school in Cricklewood. 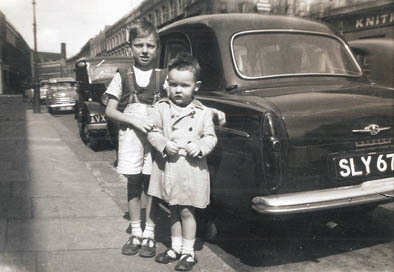 When we first moved to Golborne Road in 1952 my parents sent me to Wornington Road school but said I forgot more there than I was learning and transferred me to St. Mary’s, East Row. I passed my 11+ and went on to Sacred Heart at Hammersmith. 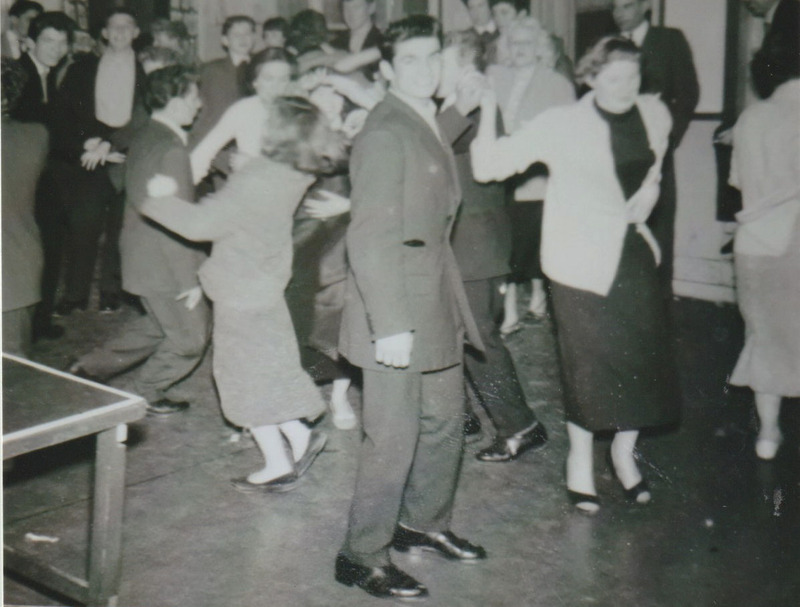 My first job on leaving school in 1962 was at the Shepherds Bush branch of Barclays Bank . All great memories Allen, Richard and Sandra, thank you for sharing. We’ve all got different stories of the area as it was, which to me added together, paint a very vivid picture of how it was. Some things I can remember in great detail as if it was yesterday and others I can’t remember at all, like the big school in Great Western Road. I’ve seen photos of it since and I read that it burned down but, considering it was such a massive building, I can’t understand why I have no memory of it being there at all. Strange how the mind works. Sandra was your husbands dad George Dibble?? Hi Mark yes my father in law was George Dibble and he worked in DAVIS the cleaning factory where he fixed the machines. So you must of known him then. Hello Sandra !! Did terry have a sister Marge !! Only mum lost contact with Her ? When I told you about these grey brick schools. When you walk down the hill from Carlton bridge towards the station. The first one was for girls only, the next one was a mixed school. Right next to the first school on the left of the building was a big greyy door with a brass knob. If you go through this door it would lead you on to a very high walkway and if you looked down you would have seen rail track coming out of a tunnel. The tunnel was called The mouse’s tunnel. It went under the Great Weston Road leading to Alfred Road goods yard. All the best Allen . P/s Roger. At the start of this Website you was talking about a new cinema called Essoldo on the Great Western Road. The old cinema was called The Grand and it was bombed in the blitz. As a young lad l was there on the day when Diana Doors opened it. All the best Allen. I waited outside of this cinema to get the number 28 bus to Kilburn High Road each weekday to go to school from 1959 to 1963. I remember watching the cleaners washing the Cinema steps while waiting for the bus. I recall feeling sorry for them having to do this job in the winter time. I did go to this cinema with my dad. I think we saw Audie Murphy in To Hell and Back. I recall there was a fish and chip shop more or less opposite. They used to sell Saveloy chips and a Wally for two Bob. Angela Kelly my mum lived with Terry and George !! She lost contact with Marge , would be great to get in touch with Her . To Rita Harper. Did you live on the old Wornington road in the 1950’s also did you have a mate called Media. She lived across the road to you . From Allen. Hi Sandra, I first meet my mate Lawrence at Brunel school in the 1956. Yes he had a brother called John and a sister called Carol. When we where 16 years old we bought Lambrettas. Did you know Lawrence then? He was always round my house at No 50 Kensal road. We both had a mate, his name was Keith Hill. All the best Allen . HI Mark, your grandmother was Mary Kelly, heard her mentioned a lot in the past on this site. Certainly got the brain working again. I’ll post message onto Marge. To Rita Haper Hello . Do you have a sister named Joyce . All the best Allen. Hi Rita . Did you know me in 1958 to about 1960. All the Best. Allen. Hi Sandra . Did you go on Rogers walk and what was the old kensal road like. All tithe best Allen. Hello Sandra !! Did you get in Touch With Marge?? Sandra !! To make it easy my E mail address is markqpr55@hotmail.co.uk! Drop me an email and I can pass on my mums phone number in Spain . Hope the walk went well. It was good to meet Sandra and everyone on my walk last Saturday. I really appreciated everyone turning out, twenty people in total. A great turnout and almost all of the walkers who remember the old area like me chipped in with some stories of their own. There were a lot of very kind comments at the end about how much they enjoyed it and I’m especially pleased for the younger people who came on the walk who I hope got a sense of what it was really like back then when so many of the old streets and buildings have completely disappeared. I will probably repeat the walk sometime in September or early October for anyone who missed it.